Shepherd Market in London's Mayfair is a rather refreshing oasis of calm and old-school refinement, sheltered from the pomp and swagger of the rest of this sometimes over-the-top neighbourhood. Set within small covered streets and piazzas there are beautiful shops, bars and restaurants where the discerning city chap or chapess can while away their time with plenty of aplomb. Nestled within this collection of chic establishments one can find the rather appropriately named "Shepherd Market Wine House", which opened a few weeks ago and I was lucky enough to be invited along to see what they were up to. From the outside the bar looks like it has been transplanted from the side-streets of Bordeaux and plonked down into Mayfair. 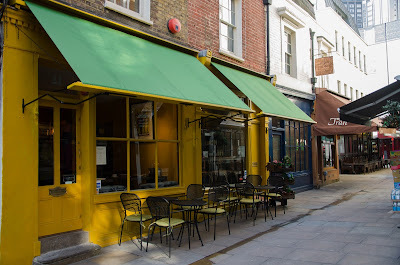 It has a welcoming yellow facade along with some green awnings that shelter a small number of outside tables that allow people to take an al fresco glass of wine or two. Inside, the bar is not overly large, on the top floor there are about ten tables that sit variously between two and six people. There is a downstairs area with a few more tables and a semi-private room that has a table that can sit eight people around it; this table is the only one that can be pre-reserved (for an agreed minimum spend), all others are strictly walk-in only. The whole bar is tastefully decorated with plenty of wine memorabilia, French film posters and arty photographs adorning the walls. In the main room, where the till is, there is a presentation table that when I was there was proudly displaying a very fine looking leg of Jamón Ibérico. We met with Ben, the bar's manager, who spoke with great passion about his love of wine and his determination to make Shepherds Market Wine House a success. The concept is a relatively simple one: he stocks a wide range of wines, but with not too many of each one (I'm guessing that storage space is at a premium, particularly when you imagine how expensive property in Mayfair is!). Once a wine is sold out he sources new wines to take its place. This way the wine-list is always changing and evolving. 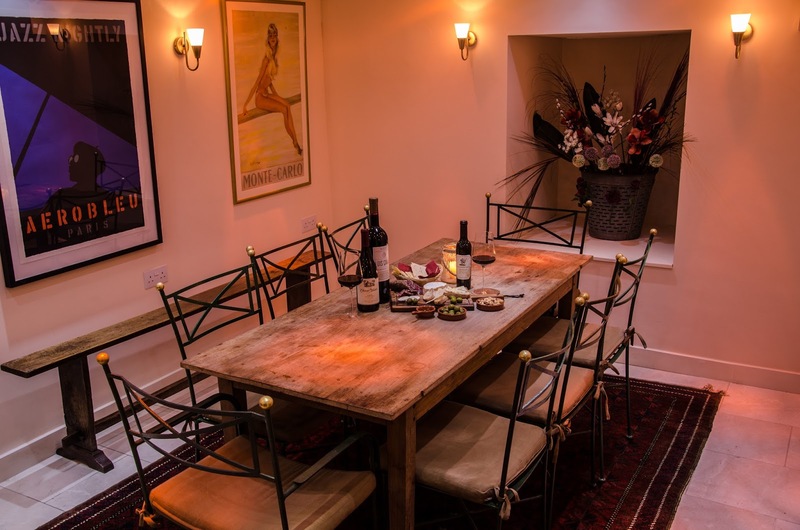 The majority of his clientele are people that live and work around the area and as such they will visit relatively regularly and will want to taste different wines. All of the wines that are on the list can be bought to be taken away from the shop. On the menu there are a selection of wines available to buy by the glass (125ml glasses). The selection was nicely thought out; on the bubbles front there was a Champagne and a Nyetimber, on the whites it was an intriguing, eclectic mix (dry Furmint - yes! ), the reds were slightly more traditional featuring French and American classics. They also serve some rather special wines from the Coravin wine system, which allows you to taste something truly spectacular. The wine list itself makes for a very interesting read. 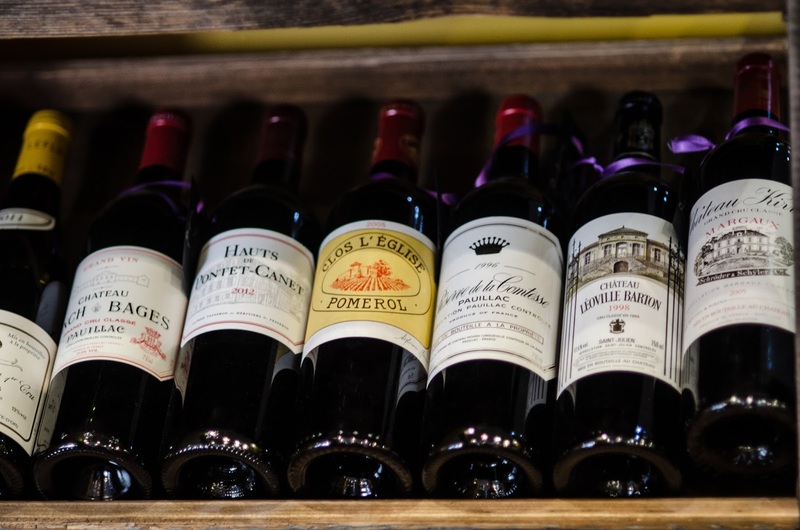 Being in Mayfair, there is a strong presence of the classics which is entirely to be expected: Burgundy, the Rhone and Bordeaux are all well represented; their left-bank Bordeaux selection is particularly impressive. However, they also have some more left-field selections: Lebanese white anyone? I always judge a wine list on whether they have any German wine as I have always felt that you cannot be a serious wine bar without having some German wine; fortunately this bar passes the test with two interesting looking Rieslings. We tried a number of offerings and were mightily impressed with them all. We started with a glass of their by-the-glass champagne, the NV Lallier Grande Reserve Grand Cru (£10.50/glass, £65.00/bottle) which was very elegant with fine bubbles and a bright acidity. This was not a particularly "toasty" champagne, but one characterised by its brightness and tart fruit. Next up we tried a glass of 2013 Sancerre from Domaine Crochet (Loire, France; £46.00/bottle) which had a pretty elderflower and bright green apple flavour. I have said before that I much prefer Sauvignon Blancs from Loire to those from New Zealand, precisely for their elegance and their slightly under-stated nature. This was a great example of this quality. For a red we tried a 2012 Chateau Ste Michelle (Washington State, USA; £32.00/bottle), this had a lovely white pepper Syrah nose and a smooth, velvety mouth-feel with beautifully integrated tannins. If I had been told that this were a Northern Rhone Syrah I would not have been surprised at all, this was a beautiful wine at a very good price. We tried another of their by-the-glass reds next with a 2013 Chorey-les-Beaune (Burgundy, France; £11.00/glass, £42.00/bottle) which was a thoroughly decent Burgundian Pinot with plenty of fruit on it, but lacking in any more complex secondary profiles. Last up I decided that I had to try one of the wines from the Coravin system as they looked too good to pass up. 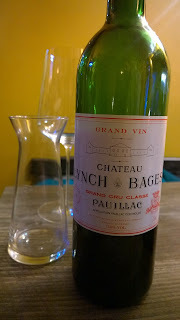 I opted for a 1995 Chateau Lynch Bages (Pauillac, Bordeaux; £29.00/glass, £175.00/bottle) which is a 5th growth wine. The aroma to this wine was something wonderful to behold, it started off with deep fruit notes of a blackcurrant jam and then developed more complex secondary and tertiary notes of truffles and tobacco. On the palate it had an amazing concentration to the wine with a noticeable presence of acidity, which belied its 20+ years in bottle. For me, this was exactly why Coravin is a great system - I would be reluctant to spend so much money on just one bottle of wine prior to having tried it, as I couldn't be sure that it would be worth it. Now that I have tried it, I would be much more inclined to splash the cash! As with all good wine bars, Shepherd Market Wine House serves a small selection of charcuterie style nibbles to accompany their fine wines. 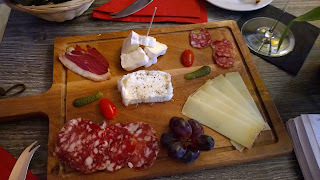 We had a lovely platter with some Comte, Goats' cheese and a special French cheese called Pont-l'Évêque. On the meats front we had a delicious salami that contained fragments of truffle, but the star of the show was a beautiful portion of thinly-sliced smoked duck breast; simply divine! These little morsels of food were the perfect accompaniment to the beautiful wines. If you find yourself in Mayfair and have an hour to kill I would heartily recommend giving Ben and the team a visit. They will help you find something perfect to sip on and, despite being in Mayfair, they have wines to suit all budgets. Many thanks to Ben and the team for looking after us so well. I certainly plan on returning! Disclaimer: I attended as a guest of Shepherd Market Wine House and only paid for the '95 Lynch-Bages, nonetheless the opinions contained within this article are my own and were not in any way influenced by the hospitality.